It's Spring. It's time to Rearrange, Revamp, and Renew. 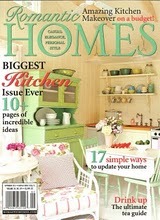 You've probably heard that I was featured in March 2012's Romantic Homes magazine French Glamour issue. Here are photos from my living room, the room pictured in the article as it appears today. I've been working on this in my house. By simply moving treasured items around, you can rediscover them. This is a budget friendly way for you to redecorate a room or your entire home. If you didn't know, I've really been struggling financially to get by for several years now, but the constant want for new and different things never goes away. By rearranging, you get the feeling something is new, even though you may have had it for years! For example, I've had these candelabras for almost 5 years. They've been moved here and there around the house, but they never really found a place until now. They were almost going in my "accessory out box". I actually have a box for items that no longer fit my style or I simply no longer want. Nicer items end up in my online shop or go to a consignment store. Less nice items go to the yardsale pile or get donated. I've actually made some money from selling off some of my collections. At first it was really hard parting with things, but last April when I finally got going at it I cleared out literally over 10 truckloads of furniture, dishes, lamps, artwork, and then some! I sold enough stuff at the first yardsale to pay for my kitchen remodel! Oh--did I mention that my home is only 1,180 square feet? I love this vignette! I got this antique set of Shakespeare books at a yard sale, I love their faded aqua color. The linen topper is a kitchen towel. I added legs to this garage sale find cubby to make it a proper side table. More on that next week. Lots of cloches with faux plants help complete the Spring transformation. When I got the new sofa, I moved the settee into my bedroom, and placed the sofa underneath the window. I love how it really opened the room up. I need to move the chaise into the pink guest room and find a nice pair of chairs to go in the living room. I might paint the green chairs in my dining room with the fabric spray paint I discovered yesterday! More on that soon. Yes--the peonies are fakes, too, but you have to be on top of them to tell! I got them at Pier One for 49 cents a stem! FYI--as of this positing, there is one Santos Crown and one set of 3 Ex Voto hearts left in my online shop! I put the chaise over here for now. I need more seating in the living room, so this will have to do for now. The table and chandelier on a birdcage stand help divide the space from the dining area. I'm thinking of putting a room divider screen here. What are your thoughts? Again, nothing new here. Flowers from the kitchen, bust from the dining room, table from my bedroom, mirrored plateau from under the sofa, marble compote from the dining room. On another note, I'm thinking of carrying hand made in the USA beaded bulb cover in my online store. I'm currently talking with a supplier and am waiting on product samples. I would probably have to do pre-orders to start. I'm not 100% sure what the lead time would be. They come in rounded and faceted beads in clear, topaz, aqua, pink, and red. They would range in price from $30 (candelabra sized) to $100 (standard light bulb) each. You could also opt for ones made from Swarovski crystals, but they would start around $140 each for a candelabra sized bulb cover. Email me with questions or if you'd like to pre-order! Chat at you next time!